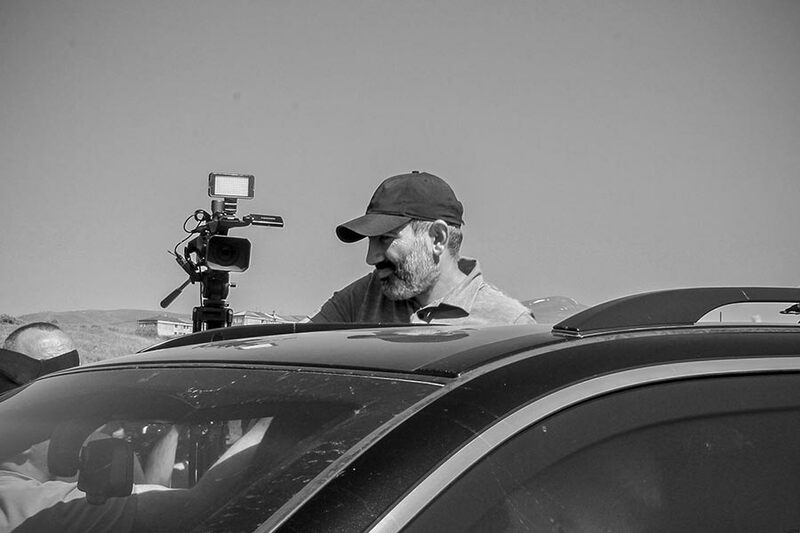 Being an Armenian based in New York for years, but now back in my home country, I was contemplating around ideas such as homeland and the information that it carries with its soil and water, individual’s need for acceptance by the tribe and going against nature. I was sitting in my room on a hot summer night, writing a fiction film screenplay about a young female scientist, who’s repatriating to her homeland, Armenia, in order to work on an ambitious mining project at a mountain, but becomes a bearer of a self-destructive force as a result of a strange metaphysical encounter inside the mine shaft. Two mine workers are seen standing at the entrance to the mining site. A car with private security is patrolling the territory from trespassing at all time. Men are seen gathered around an undressed half-body mannequin, which used to have a mine worker’s uniform on. As an act of protest, they undressed the body and set the uniform on fire. 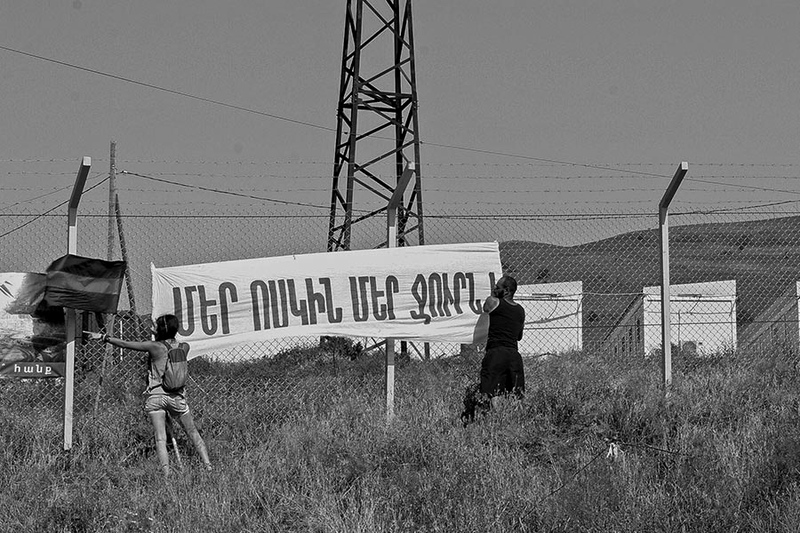 Environmental activists place a poster at the gates of Amulsar, which reads “our water is our gold”. Amulsar gold mine is situated next to a spa town Jermuk, which has hot springs, geysers, mineral water pools, a large reservoir and Armenia’s main water-providing river Arpa. Environmentalists, among facts like cyanide dust and uranium’s danger, are concerned about large-scale contamination of public waters with acidic drainage due to the mine’s operation next to those sites. Neighbors from villages of Kechut and Gndevaz, didn’t communicate well with each other for years. 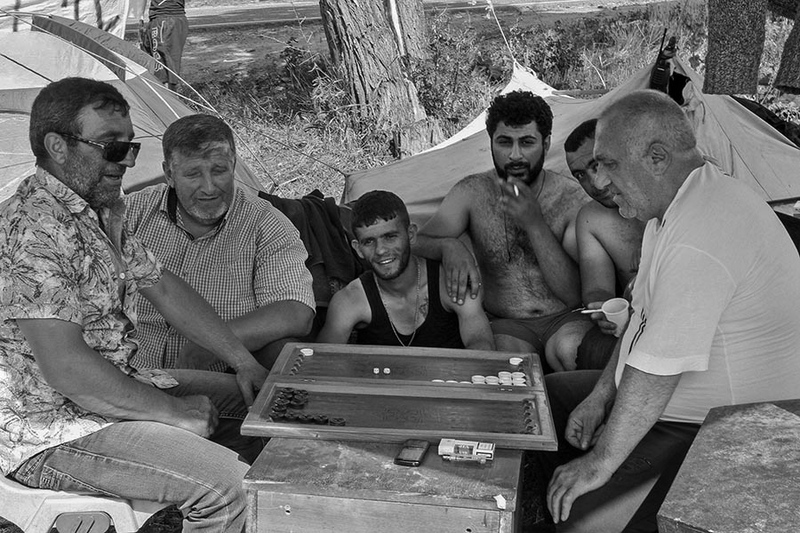 A joint group of local protesters, who blocked the entrance to the mine, are seen playing backgammon on the twelfth day of their sit-in. 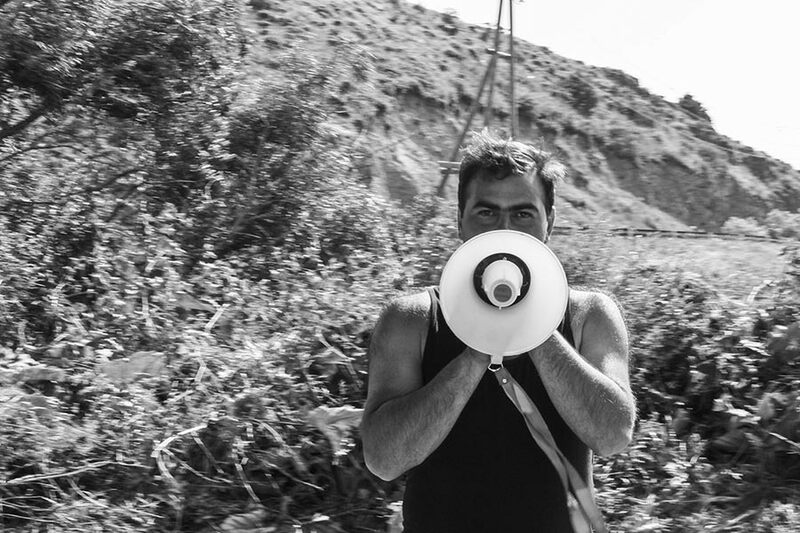 Tigran, one of the local protesters from Kechut, holds a megaphone, standing in front of the entrances to Amulsar mine. 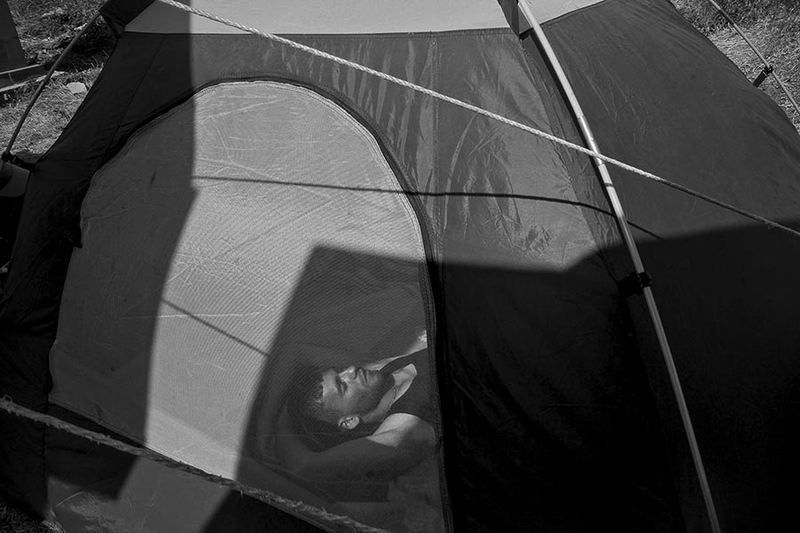 Vahe, one of the local protesters, rests in his tent in the middle of the day. 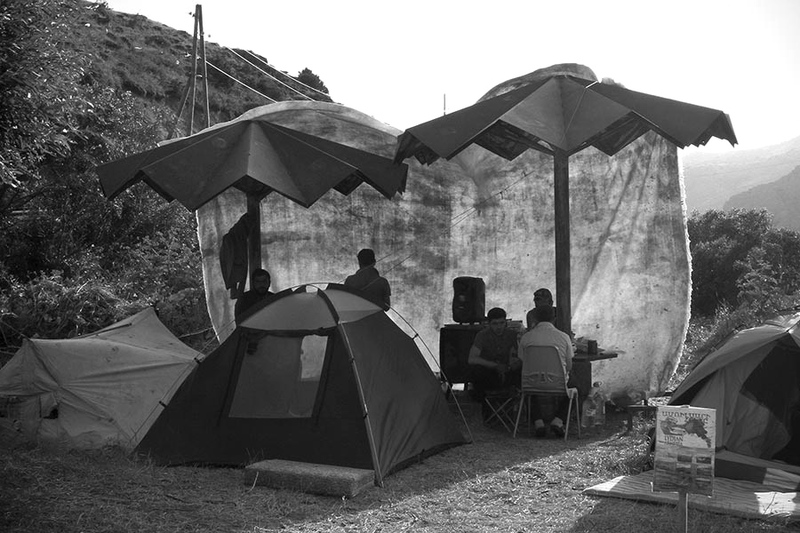 Most of the participants of the sit-in spend nights chatting, making fires, singing and playing music. 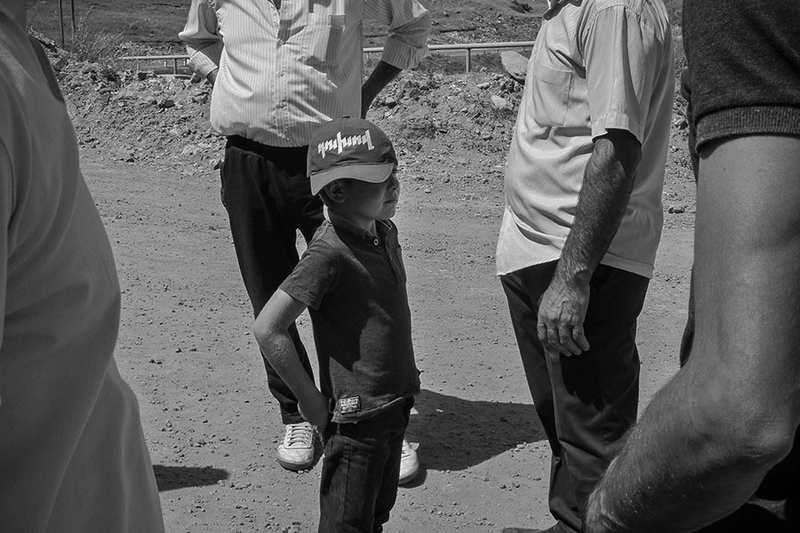 A child of one of the villagers is wearing a cap, famous for its “dukhov” caption. This word, translated from Russian, means “high-spirited” or “ready in spirit” and was used as one of the main mottos during Armenia’s Velvet Revolution in May. A similar cap was worn by current Prime-minister Nikol Pashinyan, who leaded the revolution. 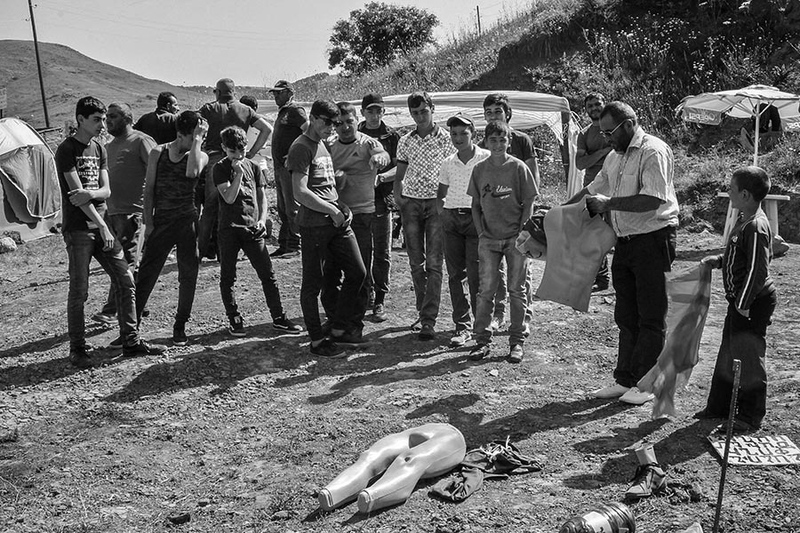 The men seen on the picture, have gathered waiting for Nikol Pashinyan’s arrival to Amulsar. 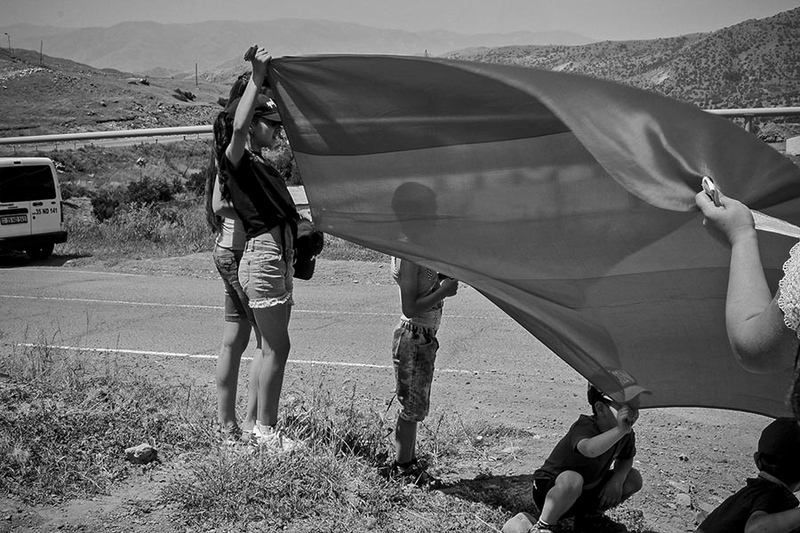 Children of Amulsar hold the Armenian flag, waiting for Prime-minister Nikol Pashinyan’s arrival. 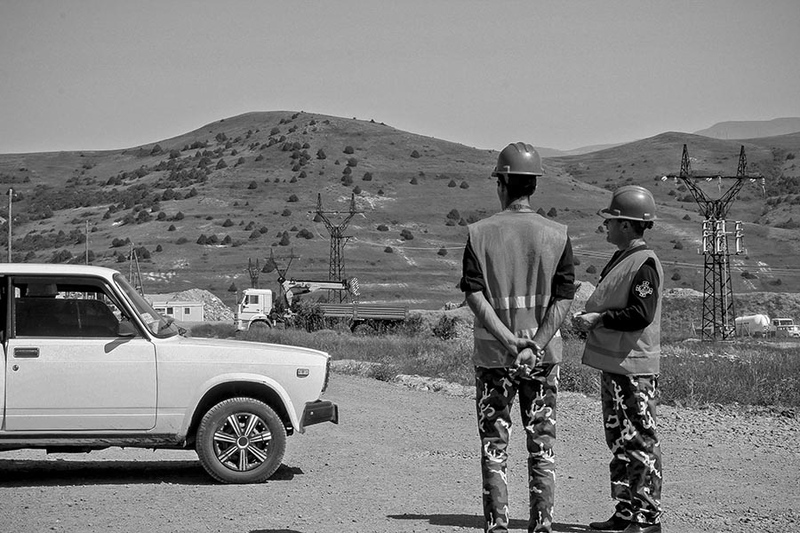 Nikol Pashinyan, the leader of the Velvet Revolution and current Prime-minister of Armenia, pays a visit to Amulsar to talk to the mining company officials and moderate a conversation on behalf of the people concerned with the mine’s safety. 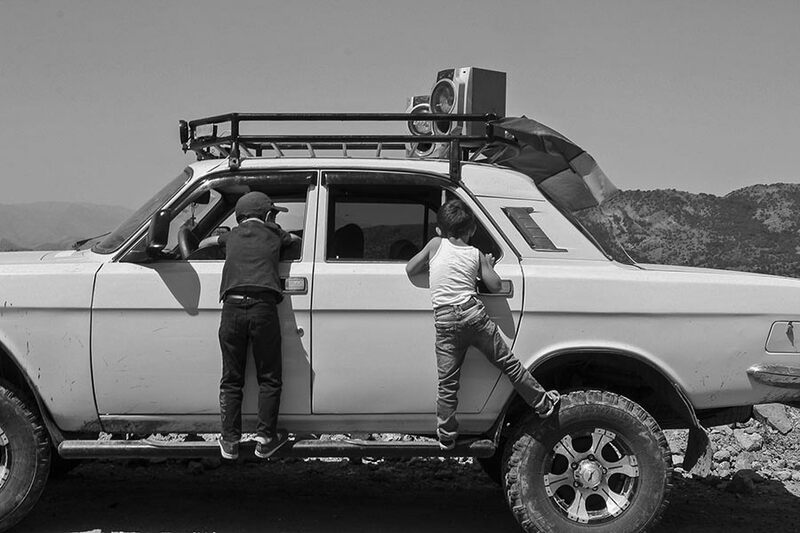 Children of local protesters are seen playing and climbing the car, parked to block the road leading to Amulsar mine. The end of a busy day of a group of environmental activists from Yerevan, who have joined the locals at Amulsar sit-in, heading from post to post in support of the local protesters. 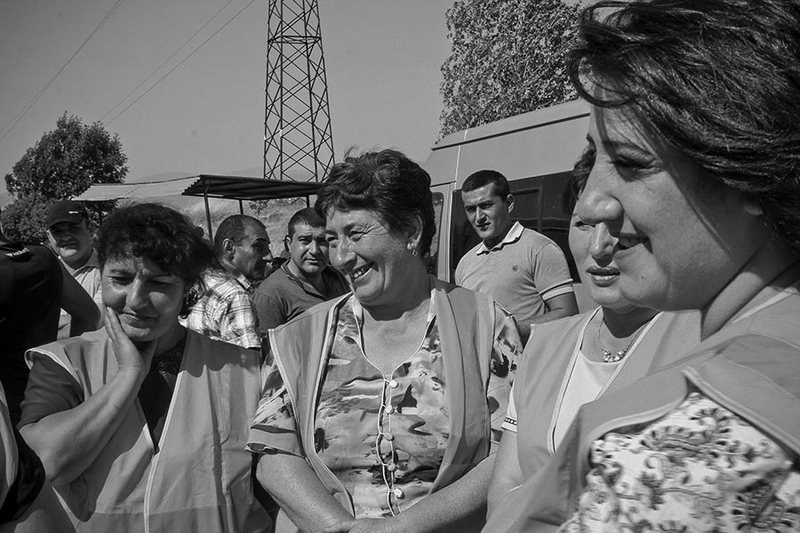 A group of women of Gndevaz, Amulsar mine employees, stand at the entrance to their village, awaiting the arrival of Pashinyan, wearing uniform in support of the mine’s launching and its further operation. 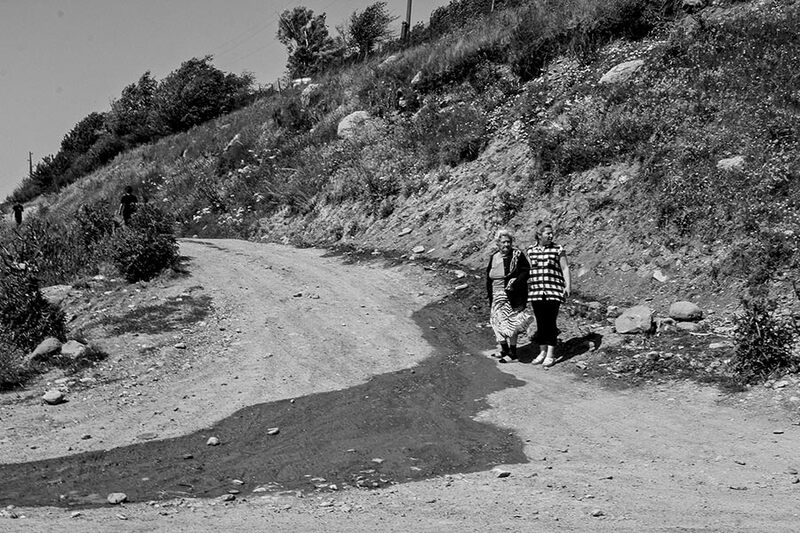 Two women are seen standing on the road of Jermuk, Armenia’s spa town, waiting for the Prime-minister Pashinyan’s arrival. At the time, I had no idea, that about a 150 kilometers away from me there was this exact mountain, a real one, with a mine in it, like a fresh wound. Amulsar, translates as infertile mountain, being the only infertile soil around, that doesn’t grow amazing pines and herbs and flowers, as tall as a teen. It’s because of the presence of uranium in it, say locals and the environmentalists. Of course it’s not completely futile: it hides gold in its depth, a fact that brought the international investors. The activists gather for a mid-day activity at one of the posts, which is an old soviet-era viewing and resting point in the mountains, called Zhiroyi Aghbyur, overlooking the mine. This mountain’s new and yet unexploited mine, along with its concerned inhabitants of neighbouring spa town Jermuk and villages of Gndevaz and Kechut, were as real, as was nothing else in my story. This was a call for me to explore my own story within a real story, somewhere in alternative reality. When I got to Amulsar mount, it was dug-up from the top and had factory facilities placed at its foothill. I felt our connection, looking at it and realizing that it somehow connected with me on a metaphysical level, making me write its story. I started taking photos. 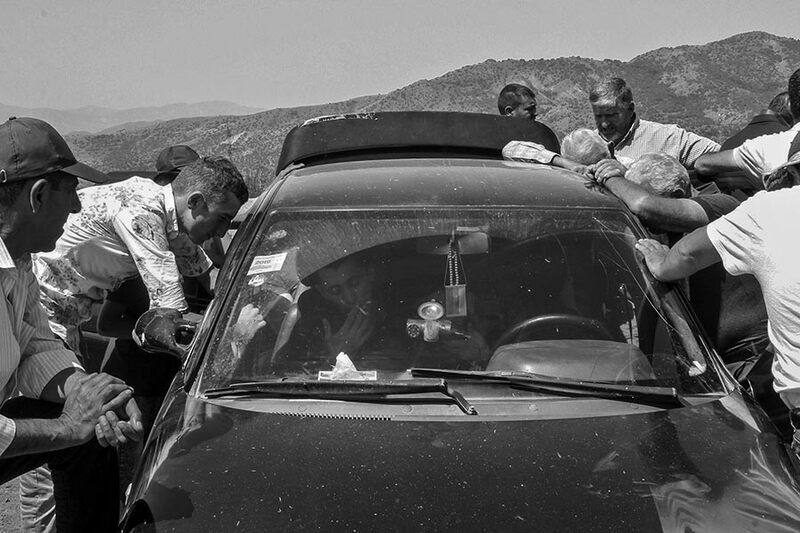 Villagers of Gndevaz are seen listening to a live news broadcast from a car radio speaker, as Nikol Pashinyan negotiates with mining company officials discussing possible resolutions. Amulsar was asking for people’s help for many years now, but not many listened in the villages. After the May’s velvet revolution in Armenia, people felt in power and inspired to continue fighting on a local level. So they got up from their homes, took tents and mattresses and went to block the roads leading to the mine. 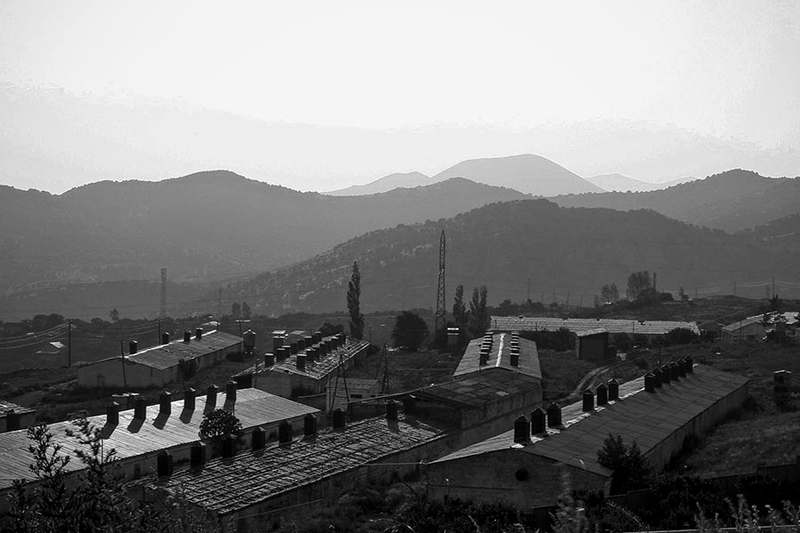 A poultry farm, situated across the Amulsar mine. There was no change of air for many years. People didn’t talk to each other much about environment or rights. But this time things are different: I found all of them on the streets, protesting and being the actors of a story they wanted. I was looking for my own story there, and I found its traces everywhere I went: in the spring water and the beautiful nature, inside the stressed looks of the mine administration, in the simple pride of the protesters at every post I visited and documented in Amulsar.